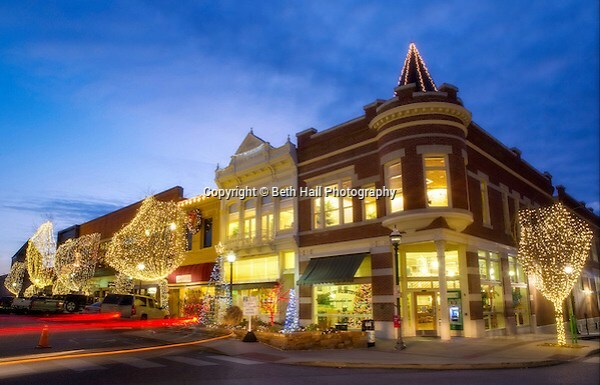 I spent an evening last year shooting stock photography of the Lights of the Ozarks. It was a cold, quiet evening that brought back memories of an old tradition with a group of friends. Many, many years ago, I used to run with a group on Monday nights. We had a summer route at Tilly Willy, and a winter route through downtown Fayetteville. I always loved our winter runs from Thanksgiving to New Years Eve because our route took us through the Fayetteville square and the Lights of the Ozarks. There was always something special about running under the lights and listening to the Christmas music fill the cold, quiet air. Now when I stand under those lights, I think about how much I miss the runs with that group of friends and the fun dinners that always followed at a local restaurant. It’s always a great memory that brings a smile. The lights are such a great tradition for Northwest Arkansas from the parade and lighting ceremony, to Last Night Fayetteville and the Hog Drop. I look forward to visiting every year and taking a trip down memory lane… and photos. It’s always such a beautiful place to photograph. What are some of your best memories of the Lights of the Ozarks? Newer Post 2015- A year of changes for this Arkansas Photographer	Older Post Top 10 things this photographer is thankful for today and everyday.